Expert training. OSHA compliant. Affordable. If you need CPR training to satisfy an OSHA-mandated job requirement or you just want to know how to keep your loved ones safe, the American Red Cross has world-class instructors and award-winning online courses to ensure that you get the latest information, and quality instruction. 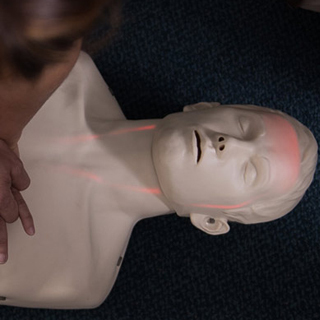 With more than 550 locations across the United States and the option to choose from online or in-person courses, or take a blended Simulation Learning class that combines online learning with hands-on, in-person instruction, there's a Red Cross CPR class for the way you learn best. The American Red Cross delivers CPR training designed for the way you live, and learn. With options available on weekdays and weekends, plus online, in-person and blended Simulation Learning courses, you can get the CPR training you need on your schedule. And with world-class instruction, no matter which type of course you take, you'll gain the skills and confidence necessary to perform this life-saving procedure when it's needed most. When it comes to CPR, it's important to know how to treat both kids and adults. That's why, unless you sign up for a class that focuses on one population, our CPR trainings cover the procedures/steps for caring for adults, as well as children. Although we will prepare you to deliver care when it's needed most, the truth is, if you don't use your skills regularly, you're likely to lose them. So, to help prevent or mitigate loss of skills we offer online refresher materials that can help you retain the knowledge you've gained. In addition, we also provide you with access to a printable list of the basic steps for performing CPR. This way, you can keep the information you need right at your fingertips.